Stents that prop open a heart disease patient's blocked arteries don't offer significantly greater benefits compared to drug therapy alone, new research suggests, which could reduce the frequency with which doctors use this invasive, yet common, treatment. American researchers have found that heart disease patients who had stents implanted and took medication experienced less chest pain in the first two years after they began treatment. However, that benefit dissipated by the third year after starting treatment. "What we found, somewhat to our surprise, is that both groups of people, whether they were treated with stenting or medical therapy, that over one to two months they all had substantial improvement in quality of life," lead study author, Dr. William Weintraub, told CTV News. "We also found there was some advantage in being treated with stenting but not over time." "The conclusion is that people are going to get better, and there is some advantage to stenting but it is not that large. The majority of people can be treated with medical therapy alone." The Courage study, as it is known, is published in the New England Journal of Medicine. Earlier results from this study of 2,200 patients found that those with stents did not have reduced heart attack or death rates compared to patients who were on medication alone. Hundreds of thousands of patients get stents every year, said Weintraub, cardiology chair at the Christiana Care Health System in Delaware. 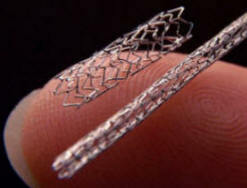 However, there has been little research on how effective stents really are. A stent is a wire mesh tube that acts like scaffolding, holding an artery open to improve blood flow to the heart muscle and relieve chest pain. A stent stays in the body permanently. However, the findings suggest they should primarily be used on high-risk patients, while low-risk patients should be given drug therapy alone, said Dr. Robert Chisholm of Toronto's St. Michael's Hospital. "So the Courage trial tells us that in this low-risk population we should try medical therapy first and if it fails we should move on to coronary stenting," Chisholm told CTV News. Chishold added that Canadian doctors are already treating fewer patients with stents and reserve them for higher-risk patients. This trial backs up that practice, he said.